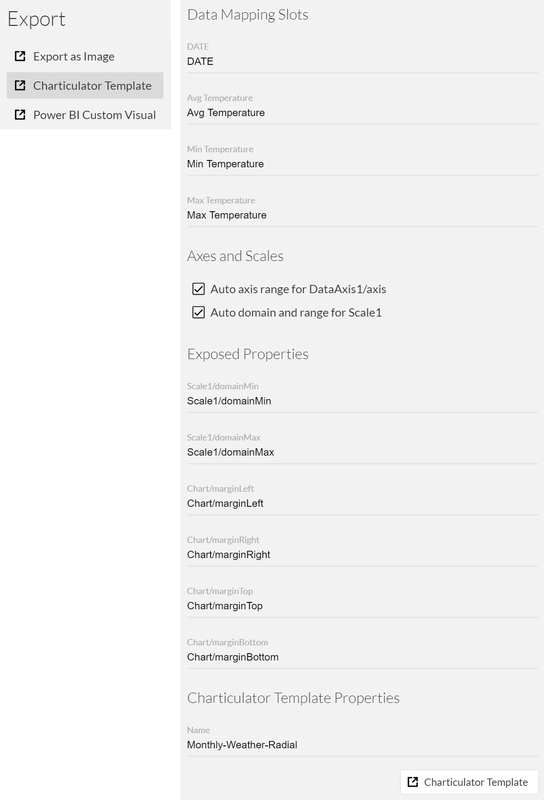 You can swap in a new dataset into an existing Charticulator session. Clicking a icon in the Dataset Panel will display a file open dialog so that you can select a new dataset file. Note that the new file should have the same structure — the same number of columns as well as same column name and data type for every column. You can reuse your chart design in six ways: (1) save it in the ‘My Charts’ list within Charticulator, (2) download it as a chart file, (3) export it as an image file, (4) export it as an HTML file, (5) export it as a Charticulator template, and (6) export it as Power BI Custom visual. You can save chart designs to the ‘My Charts’ list. Please note that your data and your charts remains local in your browser unless you download them as a chart file. Once your chart is saved to the ‘My Charts’ list, you can open the saved chart or download it as a chart file from the list. To open a saved chart, click the icon from the main toolbar to see the ‘My Charts’ list, and then click the item from the list. To download the saved chart, click the icon at the bottom right corner of the item. You can open the downloaded chart from a different machine. 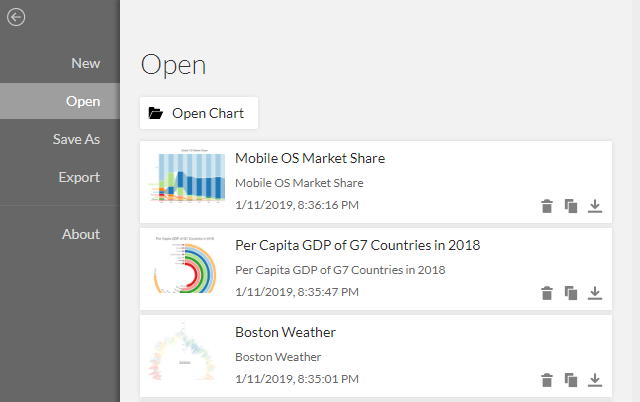 Click the Open Chart button in the Open panel to select the chart file. Please note that a downloaded chart file contains both data and chart design. 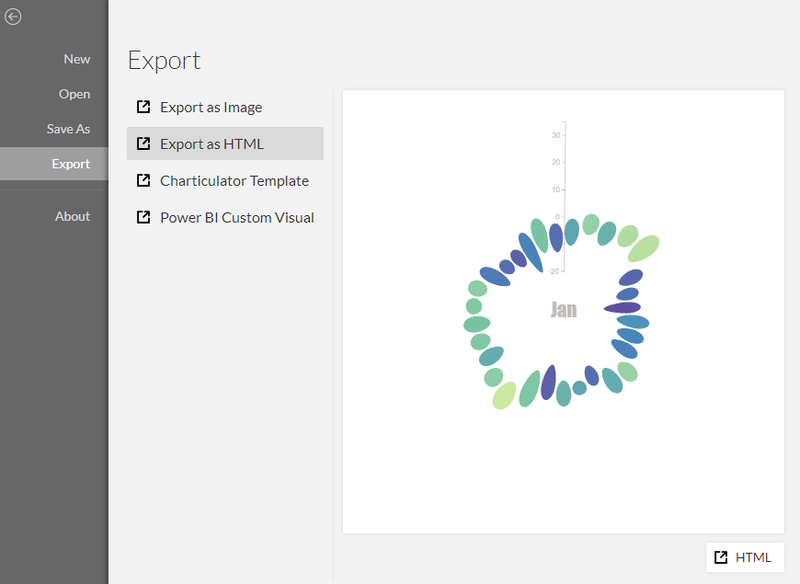 You can export chart designs as images in PNG, JPEG, and SVG format. For the PNG and JPEG formats, you can specify the desired DPI (Dots per inch). 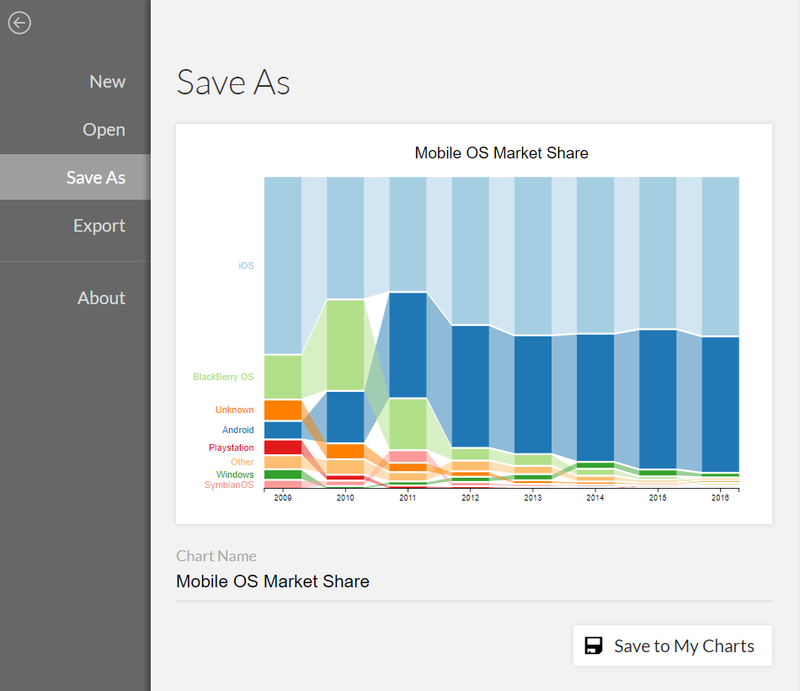 You can export chart designs as an HTML file. 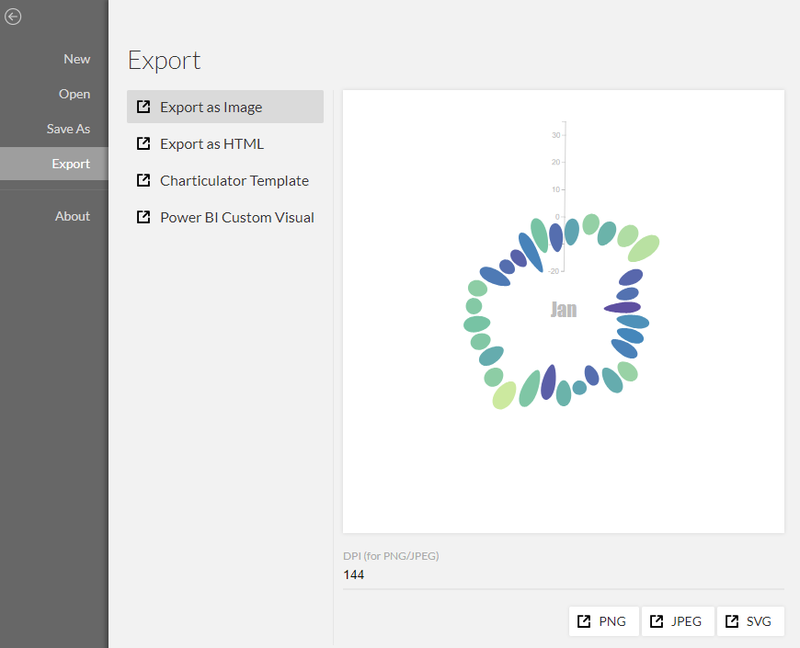 You can export chart designs as a Power BI Custom Visual (.pbiviz), which can be imported into Power BI. 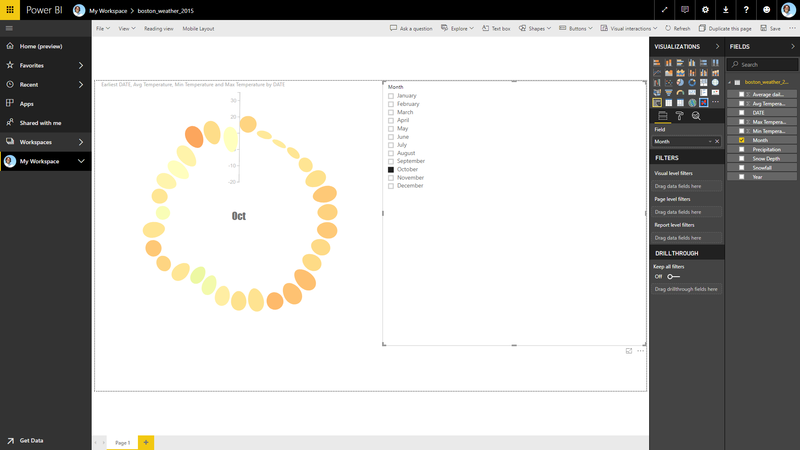 ( ) Note that not all chart designs can be exported as a valid custom visual that can be imported into Power BI. Charticulaor allows you to create a small multiple, a series of similar graphs or charts using the same scale and axes, by using a nested chart (or a chart component). You first need to select the “Group by” field of the Plot Semgment before adding the Nested Chart compenent to the Glyph Editor. For example, if you want to create a small multiples with 12 months of Boston Weather, choose the “month” from the DATE data column. Once the group by is applied, the guides layout within the Glyph Editor is updated accordingly. 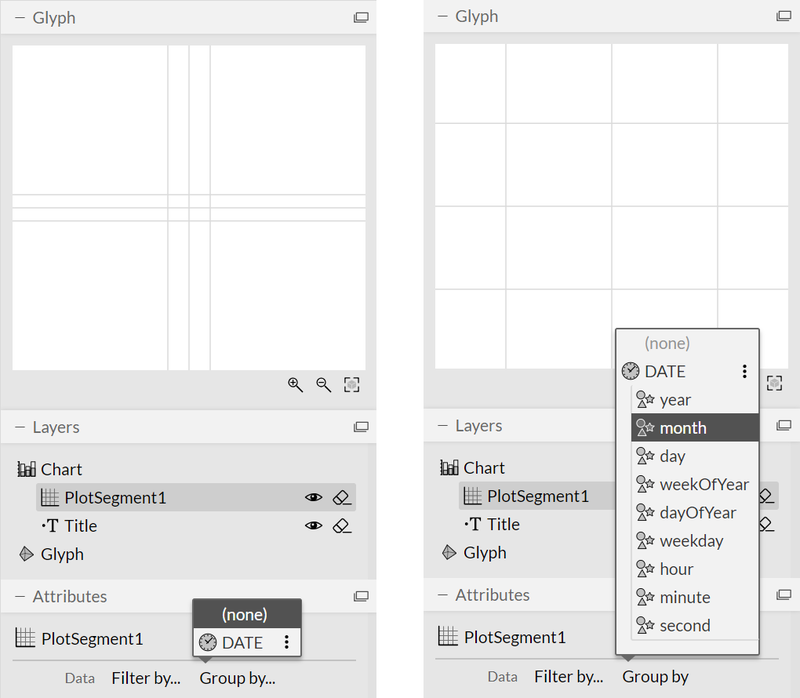 To add a nested chart component to a glyph, you can drag it from the Toolbar and drop it into the Glyph Editor. 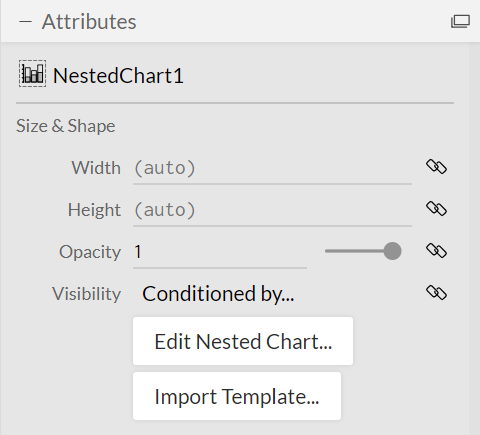 Once a nested chart is added, you can edit it directly or import a Charticulator Template. Because a small multiple typically needs larger space than a single chart, it is a good idea to increase the chart size before editing the nested chart. Unlike the main Charticulator page, the header will have the “Save Nested Chart” button. Whenever you click this button, the main chart will be automatically updated. You can swtich back and forth between the main Charticualtor and the one for the nested chart.